Amtrak offers a true daytime first class service only on its Acela Express service in the Northeast Corridor. Larger seats, a 2-and-1 seating configuration, complimentary beverages, and access to private lounges in major stations, are among the amenities provided when purchasing a first class seat. The pricing system works exactly the same as it does for business class seats on non-Acela Express trains: a fixed accommodation charge for the service is added to the cost of the standard level of service on Acela Express (the standard or base level of service on Acela Express is business class) and linked directly to the availability of discounted inventories in business class. Let's take a look using the example of a one way from Boston to New York on 30 December. First, here's the fare display. Below that appear the five different levels for business class on Acela Express, starting with $101 (DOAE) booked in KD inventory, all of the way up to $168 booked in K inventory. The $76 accommodation charge will be added to one of these fares, depending on the inventory available to sell. Available inventory of the five first class inventory codes matches their corresponding inventory codes in business class. Now lets look at Acela Express availability on the 30th. The five first class inventory codes mimic the hierarchy of business class. PD (KD), PC (KC), PB (KB), PA (KA), and finally P (K) for the full fare. Let's determine the price for a couple of these. The first train, # 2155 at 7:15 a.m., has PD seats available (because KD is available) so a first class seat on this train would cost a total of $177: the DOAE fare of $101 plus the $76 accommodation charge for first class. The third train, # 2163 at 11:15 a.m., has 5 PD seats available (because there are 5 KD seats available) and would also cost $177. The fourth train, # 2167 at 1:15 p.m., only has P seats available (because all of the lower cost inventories for business class are sold out) so a first class seat on this train would cost a total of $244: the KOAE fare of $168 plus the $76 accommodation charge for first class. The fifth train, # 2171 at 3:15 p.m., has 2 PA seats available (because there are 2 KA seats available). The price for a first class ticket would be $227 (the AOAE fare of $151, plus the $76 accommodation charge for first class). In the next chapter you'll see how Amtrak prices sleeping accommodations. It is similar in some respects to the pricing for business class and first class, but with some very important differences. Union Pacific trackwork will result in another opportunity to make the rare trip over the Tehachapis. Additionally I would expect that this detour would use the Altamont Pass route to get access to Oakland since I can't imagine how else it could! Too bad it will probably be dark by the time it reaches the area, as the line over the pass and then through Niles Canyon is very pretty. This is track used now by the ACE commuter trains, and historically by the original Western Pacific California Zephyr. Here's the post I wrote back in October '08 when I rode the detouring Coast Starlight. That detour operated "nonstop" all of the way to Sacramento skipping the Bay Area altogether. If you book yourself a trip on the train in the expectation that it will make the detour, you should to contact Amtrak a few days in advance to reconfirm, as track maintenance plans can change. On Amtrak's higher speed premium Acela Express service in the Northeast that links Boston, New York, Washington DC, and major intermediate cities, the minimum service available is business class. Because of that, the pricing for business class on Acela Express is similar to that for reserved coach on other trains, with the main difference being that instead of the 4 fare levels and corresponding inventory codes/buckets, there are 5 fare levels and inventory codes on Acela Express business class. Let's start by looking at a fare display from New York to Washington, DC, so you can see the hierarchy of fares. This is for travel on 23 December, the day before Christmas Eve (Christmas Eve Eve, if you prefer). Starting from the top, the lowest fare is $142, fare basis DOAE, booked KD inventory, followed by the COAE at $166 booked in KC inventory, then $190 (KB inventory), $213 (KA inventory), and finally the full fare KOAE at $237 (K inventory). The ZOGE at $192 is also booked in K inventory but as the freeform information at right indicates, it is for government business travel. So the hierarchy of inventory codes starts with KD at the lowest (like YD is lowest for reserved coach), then KC, then KB, then KA, and finally full-fare K. And in the New York-Washington, DC market, the ladder of fares go from $142 (KD), to $166 (KC), to $190 (KB), to $213 (KA), to $237 (K), depending on what is the lowest price available on a given train. Now we'll look at business class availability for Acela Express trains from New York to Washington, DC, on the 23 December starting at 1 p.m. I've highlighted in red the lowest available inventory for each train. None of the trains have KD available. Four of the six shown have KC ($166). The 3:00 p.m. train only has KB ($190), and the 4:00 p.m. departure (train 2165) is down to only KA ($213). Our make believe traveler, Keith Test, is willing to pay more to leave at 4 p.m. and here's what his reservation on that train would look like. In the next chapter we'll look at how Amtrak prices first class service on Acela Express. Hint: if you understood Chapter 13 about how the pricing worked for business class on trains other than Acela Express, then you'll easily understand how first class pricing on Acela works. In Chapter 10, I set forth some basic principles that apply to Amtrak fares. Here are the ones that apply as we look at pricing for business class service on Amtrak. Amtrak offers business class service on many though not all short-distance corridor trains. The features vary from train to train, but they can include (though not always) larger seats or seats with more pitch (space) between them, and amenities including snacks or beverages, and newspapers. On the Cascades service in the Pacific Northwest seats are configured on a 2-and-1 basis instead instead of 2-and-2. Because reserved business class service is in a separate car and requires payment of an additional charge, it often can mean the difference between a crowded and sometimes noisy train and a less crowded, quieter experience. Business class is mostly offered on trains where coach service is reserved, but in Amtrak's second busiest market, the Pacific Surfliner in southern California, it is sold on trains where the coach service is unreserved. We'll look at how pricing works in both instances. The accommodation charge for business class is simply added to the rail fare that would apply for unreserved coach on the same train. Using the example of travel from San Diego (SAN) to Los Angeles (LAX) on the 9th of January, let's begin with a fare display. At the top of the display under "One way accommodation charge" appears "J" at $15.00. "J" represents business class service. So this means that in addition to the coach rail fare, a passenger would pay an additional $15 one-way for a business class seat. Below that, you see coach rail fares that you saw in Chapter 11 about pricing for unreserved coach travel. The UOB1 for $36 with some blackout dates, and the UOF1 for $45 without any blackout dates. Because 9 January is not a blackout date, the total fare for business class travel one way would be $51: $36 for the rail fare from SAN to LAX, plus $15 for the business class accommodation. Notice how in the fare portion it shows the breakdown as "UOB1 RAIL FARE 36.00 ACCOM 15.00" for a total of $51.00. When I worked for Amtrak training travel agents how to book Amtrak, one of the first questions I would get is whether they also needed to sell coach seats when booking business class or sleeping accommodations. Universally the answer is "no". Amtrak's system automatically prices in the coach fare, also called the rail fare. In physical terms, think of it like this. Passengers booked in business class or sleeping accommodations do not also get a seat in coach. Paying the accommodation charge earns them an upgraded seat or sleeping accommodation, but does not entitle them to also occupy a coach seat. On trains where coach service is sold on a reserved basis (inventory codes Y/YA/YB/YD), business class fares follow the same ladder from high to low, and the availability of business class inventories is chained to the corresponding coach inventories. We'll use an example from Portland, Ore. to Seattle on 15 December. Let's first look at the fare display. J at the top of the display is the additional accommodation charge one way for business class travel: $16. It is added to any one of the coach fares below, depending on the availability of coach inventory. It's pretty simple, really. In Chapter 12, you learned how reserved coach has four different levels, with the lowest priced being sold in the YD inventory, and then rising up the ladder to YB and YA and finally Y, the full-fare level. Now take a look at a 15 December Portland-Seattle availability display for coach travel followed by availability for business class. Look at line 1 (train 500 at 8:30 a.m.) on the upper (coach) availability. The lowest coach inventory available is YB, because the YD inventory is sold out. Now look at line 1 on the bottom (business class) availability; the JB inventory is available. Glance back up at the fare display and you see that the fare for the YB inventory is the BOF1 at $39. Add the $16 accommodation charge for business class to that and the total price should be $55, right? Now if booked instead in JA inventory on the 12:15 pm train, the price would be $60 ($44 + $16) or in JY inventory on the 2:50 p.m. train it would be $68 ($52 + $16). Last of all, let's consider passenger type discounts and business class. As a rule, passenger type discounts never apply to the accommodations charges for upgraded service such as business class or sleeping accommodations. In fact, I have only one recollection of such a discount over the years, and to my knowledge none are in effect at this time. But the same discounts that would apply for coach travel, can be applied to the underlying coach rail fare when traveling in business class. For consistency's sake, let's imagine two people traveling on the same train between Portland and Seattle. Two regular adults would pay a total of $110 ($55 x 2) as below for Rebecca and Michael Test. Now let's imagine that both passengers are 62 or older (seniors), and thus entitled to the 15% senior discount on the coach rail fare. Rail fare of $78 less 15% = $66.30, but the accommodation charge of $32 ($16 per person) remains the same, because it is not subject to a passenger type discount. The total price is $98.30, as you see below. Now imagine that Rebecca Test is a senior and Michael Test is a child. The $39 fare is discounted by 15% ($33.15) for Rebecca, and 50% ($19.50) for Michael for a total rail fare of $52.65, but the $32 in accommodation charges is, of course, the same. The total price should be $84.65. Amtrak pricing is actually quite sensible. Is it making sense to you? In our next chapter - a short one - we'll look at business class pricing on Acela Express. On Saturday, 29 November 1986, at age 30, I ran my first marathon: the Seattle Marathon. Though I do count it as my first marathon, the race turned out to be what I have ever since called the "20 mile run and 10K walk". Though not amusing at the time, it's a story I've enjoyed telling over the years as a cautionary tale. 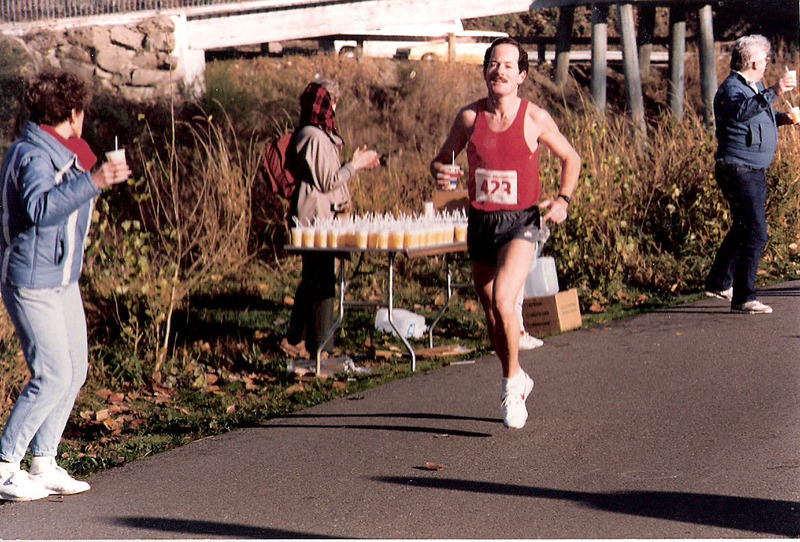 By the fall of 1986 I thought correctly that a marathon was within my reach, and I began training for the Seattle Marathon held the weekend right after Thanksgiving. I ran a half-marathon in Yakima in early October, which indicated that all systems were go. But soon they wouldn't be. At some point in mid-October on a long training run, I developed a serious pain in one of my legs and it was clear that continuing to train was impossible. A wiser, more experienced runner would have decided to not to run a marathon only six weeks later, but not I.
I didn't run at all for the next five weeks, ran a little in the week prior to the race, and then on race day I put on my bib, and got in line at the race start. Not smart. I had healed enough to run a half marathon but soon after that I would start to hurt badly. At the half marathon point my time was around 1:20 or so. But the pain that had probably been there to a slight degree from the start got worse and worse. My pace slowed dramatically, and finally by around Mile 20 I was faced with either dropping out altogether or stumble-walking the last six miles. My pride compelled me to choose the latter course of action, and I hobbled the last six very painful miles along the Burke Gilman Trail to a finish of around 3:45. Well, I finished it, but the result was an all but officially diagnosed stress fracture that led to a couple of months of no running whatsoever followed by a slow recovery. Did I learn something from this first marathon? Yes - don't run or race on an unresolved injury. That should seem obvious to any runner, but there are times when good sense goes on vacation and one runs a race against all better judgment and then quite predictably pays the price. But I've taken the lesson from my first marathon in 1986 with me. I didn't run another marathon for nearly 19 years until Eugene in May 2009. That went well. However late that same year, an injury two weeks prior to CIM (California International Marathon in Sacramento) led me to bail on that race, and unfortunately this year a hamstring injury that occurred seven weeks ago forces me again to fold my tents for CIM. Is it disappointing to skip a race you've trained and registered for? Yes. But the alternative of running on a not fully healed injury will lead at best to a disappointing performance, and at worst to a much more serious injury. Furthermore you'll spend money on hotels, meals, and incidentals for a subpar experience, when you could cut your losses by only forfeiting the cost of the registration fee. Now 25 years later, I'm happy I ran that first marathon. It provided me with a story I like to tell, even if I'm slightly sheepish about how the race turned out. I ran (and walked) the race, I learned the lesson, and there's no need to ever relearn it! 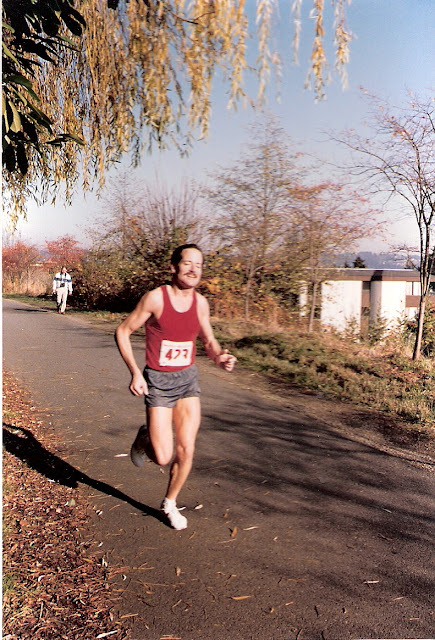 In 1985 I went to watch a friend run the Seattle Marathon when the course was a double loop: from Seward Park up to Madison Park and back to Seward Park along Lake Washington - and repeat. 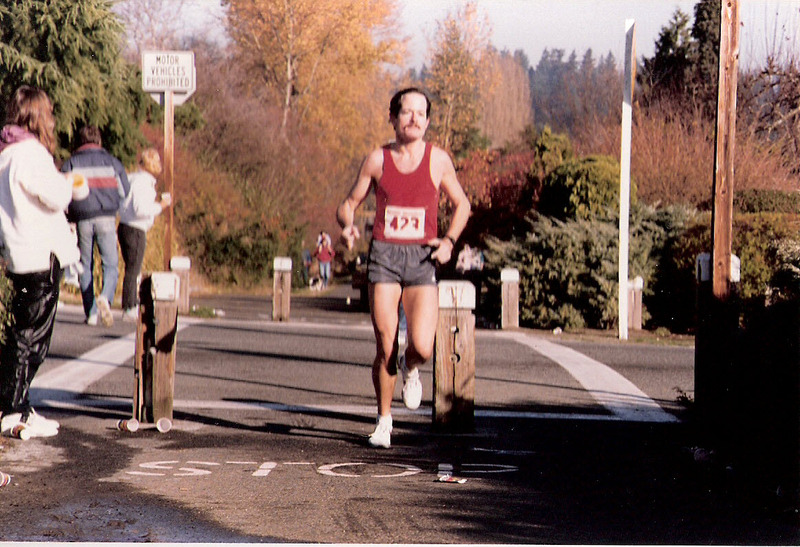 When I ran the race a year later the course had changed completely to a point-to-point route from Redmond along the Sammamish River Trail into Woodinville and Bothell and then switching to the Burke Gilman Trail to finish at an auditorium at the University of Washington campus. In 1987 the course was altered slightly so that it continued on the Burke Gilman around the university campus to finish at Gasworks Park at the north end of Lake Union. The course was the same in the following two years that I ran it. In the late 80s the bigger of Seattle's two marathons was the Emerald City Marathon which I ran in 1988 and 1989. In 1990 it became part of Ted Turner's Goodwill Games between the U.S. and the then Soviet Union, but I don't think the race was ever held again. In the intervening years since I ran the Seattle Marathon the course again changed altogether, and now bears some resemblance to the original Emerald City Marathon course. Photo credit: all photos by Doug Schwab, an Amtrak colleague of mine in Seattle.